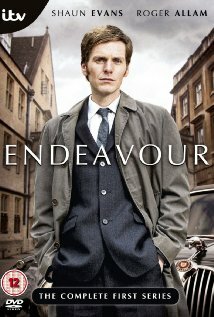 Since it aired on our local PBS station, we’ve enjoyed the Masterpiece Mystery Endeavour crime drama series. A prequel to the Inspector Morse series, also set in Oxford, the series focuses on the detective’s early career and is based on the Colin Dexter novels. The young Endeavour Morse is played by Shaun Evans, who is beginning his career as a Detective Constable with the Oxford City Police Criminal Investigation Department (CID). Over two series and nine episodes so far, the show focuses on the mid-to-late 1960s with all the fun fashions, cars and music of the time period liberally sprinkled throughout the episodes. One fun aspect of watching the show is seeing Abigail Thaw, daughter of John Thaw (the actor who played the original Morse) in the role of the editor of the Oxford Mail newspaper. In the Pilot episode, set in 1965, Morse decides to resign, but is dissuaded by veteran Detective Inspector Fred Thursday, played by Roger Allam, who also appeared in one of the original Morse episodes playing a different character. Roger Allam is no stranger to those of us who’ve watched other British crime dramas like Midsomer Murders, Foyle’s War, Inspector Lynley and Ashes to Ashes. Inspector Thursday sees that Morse is an intelligent young policeman he can trust and takes him under his wing as his assistant. Having been a student at Oxford is both a blessing and a curse for Morse since he can deal with the elite. Morse’s experience with his superiors isn’t always good since they are both envious of him and jealous of his genius in solving complicated cases. I also enjoy the show because it shows the character traits and interests of Morse as he develops into the older character that many viewers and readers of the Colin Dexter novels have come to love, namely, his love for opera and a pint or two at the local pub. Some viewers have expressed dismay that the mystery plots are less than satisfactory. A few of the episodes did seem to a rushed conclusion, but I still recommend this show highly for fans of the original Morse series and those who want to watch an entertaining police drama set in Oxford. Bobbi A. Chukran is a Texas-based author of mystery and suspense fiction. She’s been watching cop shows since she was a young tot. She remembers “Dragnet” as her first one. She blogs about her writing at http://bobbichukran.blogspot.com. Good review, Bobbi. I’ve also enjoyed this show and for much the same reasons. Thanks, J.R. Can’t wait for it to come back! Thank you for Endeavor…missing Morse but thank Heavens for Endeavor. Ellen, I feel the same way.